We bring you last week's top performances from Virgin Islanders who are playing abroad and who all have had prior experience of national team duties at youth or senior level. #1. This week's number one is an international guard Deon Edwin (190-92, agency: Interperformances, college: Kent St., currently plays in Ukraine). 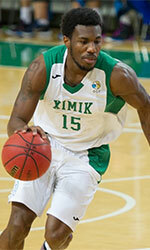 He led Khimik to a victory over the fifth-ranked Mykolaiv (9-9) 88-72 in the Ukrainian Superleague last Thursday. Edwin was MVP of the game. He recorded a double-double by scoring 20 points and getting 15 rebounds. Edwin also added 6 assists; not bad, considering it's only his second season in pro basketball. BK Khimik-OPZ Yuhzny (15-6) is placed first in the Superleague. Edwin has individually a very good season with high stats. He averages: 16.0ppg, 5.9rpg, 4.5apg, 1.8spg, 2FGP: 59.7%(105-176), 3FGP: 31.3% and FT: 68.9%. Edwin is currently a member of the U.S. Virgin Islands senior national team. #2. Second place goes to an experienced international point guard Walter Hodge (183-86, college: Florida, currently plays in Lebanon). He was the major contributor in Homentmen's victory against the closely-ranked Hoops Club (4-7) 87-71 in a derby game in the Lebanese LBL on Thursday night. Hodge had a double-double by scoring 21 points and making 10 passes. He also added 9 rebounds in 37 minutes. Homentmen Beirut (9-2) is placed second in the LBL. It was his team's third consecutive victory in a row. There are only two games left until the end of the Regular Season. So now every game will be critical. Hodge has very impressive stats this year: 20.2ppg, 4.5rpg, 7.1apg, 1.3spg, 2FGP: 53.4%, 3FGP: 34.0% and FT: 84.1% in 11 games he played so far. He has a dual citizenship: U.S. Virgin Islands and Puerto Rican. Hodge is in the roster of the U.S. Virgin Islands senior national team. #3. The U.S. Virgin Islands player who performed third best last week abroad was former international center Frank Elegar (208-86, college: Drexel, currently plays in Turkey). He contributed to Tofas' victory against the league outsider Istanbul BBSK (2-13) 87-82 in the Turkish BSL in Saturday night's game. Elegar scored 11 points, grabbed 8 rebounds and dished 3 assists. Tofas Bursa (10-8) is placed third in the BSL. Elegar has relatively good stats this season: 11.8ppg, 5.8rpg, 2.0apg, 2FGP: 62.5%(25-40) and FT: 75.0%. He is another player who holds two passports: U.S. Virgin Islands and Guyanese. Elegar played for the U.S. Virgin Islands national team three years ago. #4. Forward LaRon Smith (204-93, college: Auburn, currently plays in Bulgaria) contributed to Yambol's victory against the closely-ranked Academik Plovdiv (7-8) 82-73 in the Bulgarian NBL last Saturday. Smith scored 18 points, grabbed 7 rebounds and made 3 blocks in 26 minutes. Tundja Yambol (5-10) is placed seventh in the NBL. His team will play only one more game in the Regular Season. And now that game is very crucial. This year Smith has relatively solid stats: 13.5ppg, 8.3rpg and 3.8bpg in four games. He has both American and U.S. Virgin Islands nationalities. 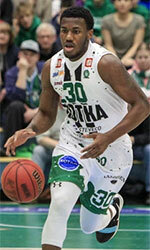 Worth to mention he played also at Eurobasket Summer League, which helped him get the job in pro basketball. Smith is also U.S. Virgin Islands national team player. #5. Former international forward Jordan Murphy (201-97, currently plays college basketball in the States), who plays in the NCAA could not help the Minnesota (4-3) in their last game on Wednesday. Despite his very good performance his team was defeated 56-51 on the road by the University of Wisconsin. Murphy recorded a double-double by scoring 16 points and getting 19 rebounds. It's Murphy's fourth season with the team. He has reliable stats this year: 14.9ppg, 12.1rpg and 2.7apg. Murphy also holds two passports: U.S. Virgin Islands and American. He used to play for the U.S. Virgin Islands national team three years ago. #6. Forward Jamaal Samuel (206-93, college: La-Monroe, currently plays in Mexico) was not able to help Huracanes (6-29) in their last game. Despite Samuel's good performance the seventh-placed Huracanes (6-29) was crushed 97-74 at home by the higher-ranked (#3) Lenadores in the North group. He scored 13 points and grabbed 7 rebounds in 32 minutes. It was Huracanes' fifth consecutive loss in a row. Samuel's stats this year are: 12.9ppg, 4.4rpg, 1.4apg and 1.4spg in nine games. He holds both American and U.S. Virgin Islands passports. Samuel is an international player who is currently on the senior U.S. Virgin Islands National Team roster. #7. International small forward Nicolas Claxton (211-99, currently studies in the States), who plays in the NCAA was not able to secure a victory for the Georgia (1-4) in their last game on Wednesday. Despite his good performance his team was defeated 89-74 on their home court in Athens by the The University of Alabama. Claxton scored 12 points and grabbed 9 rebounds. Claxton's stats this season are: 12.6ppg, 9.3rpg, 2.1apg, 2.7bpg and 1.3spg. He is also U.S. Virgin Islands national team player. #8. Guard Kyle Clarke (196-95, is currently at the American university) contributed to an easy victory against the University of North Florida (2-3) 81-64 in the NCAA on Wednesday night. Clarke recorded 8 points and grabbed 5 rebounds in 18 minutes. The Kennesaw State University has 0-4 conference record this season. Clarke has been at the team for four years. This year his overall stats are: 5.2ppg, 3.0rpg and 1.3apg in 23 games. Clarke plays currently for the U.S. Virgin Islands national team. #9. International forward Jahmiah Simmons (193-98, currently plays college basketball in the States) managed to help University of North Texas in a victory against the University of North Carolina - Charlotte (2-4) 73-66 in the NCAA last Saturday. He recorded only 4 points and grabbed 7 rebounds in 22 minutes. The University of North Texas have a very solid 5-1 conference record this season. There are only four games left until the end of the NCAA Regular Season. So now every game will be important. This year Simmons' total stats are: 3.7ppg and 4.4rpg in 23 games. He is also in the roster of the U.S. Virgin Islands national team. #10. Guard Stephaun Adams (185-96, currently plays in NAIA) contributed to a Campbellsville University's victory against the Lindsey Wilson College 84-75 in the NAIA in Saturday night's game. He recorded 20 points, 9 rebounds and 6 assists in 38 minutes. The Campbellsville University has a very solid - record this season. It's Adams' first year with the team. Adams has very impressive stats this year: 16.5ppg, 5.2rpg, 4.6apg and 2.1spg in 16 games. He is an international player who is currently on the senior U.S. Virgin Islands National Team roster. #1. John Collins (208-PF-97, college: Wake Forest, currently plays in NBA) led Atlanta Hawks to a victory over the Phoenix Suns (11-45) 118-112 in the NBA in Saturday night's game. He was MVP of the game. Collins had a double-double by scoring 35 points and getting 16 rebounds in 39 minutes; quite an impressive performance considering it's only his second season in pro basketball. The Atlanta Hawks have rather weak 18-35 record this season. Collins has individually a very good year with high stats. He averages: 19.6ppg, 9.9rpg and 2.2apg in 37 games he played so far. Collins has a dual citizenship: U.S. Virgin Islands and American. #2. De'Quon Lake (208-F, currently plays college basketball in the States) managed to help Arizona State University to win against the University of Arizona (3-4) 95-88 in the NCAA in Thursday night's game. He scored only 4 points. The Arizona State University has a solid 4-2 conference record this season. Lake's total stats this year are: 4.9ppg and 4.5rpg. #3. Quennel Francis (183-PG, currently plays in NAIA). Francis could not help the one of league's weakest teams Southeastern University (10-1) to beat the Ave Maria University. He recorded only 4 points. The Southeastern University was edged 86-83 on the road by the University. There are only four games left until the end of the NAIA Regular Season. So now every game will be critical. This season Francis averages just 2.2ppg.